From A Star Is Born. By Bradley Cooper and Lady Gaga. By Lady Gaga and Mark Ronson. Arranged by Mac Huff. Pop Choral Series. Country, Southern Rock, Pop, Movies, Pop/Rock, Show Choir, Rock, Duet. Octavo. 12 pages. 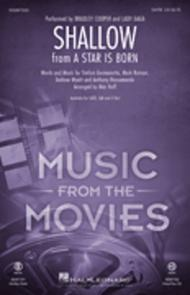 Published by Hal Leonard (HL.287325). 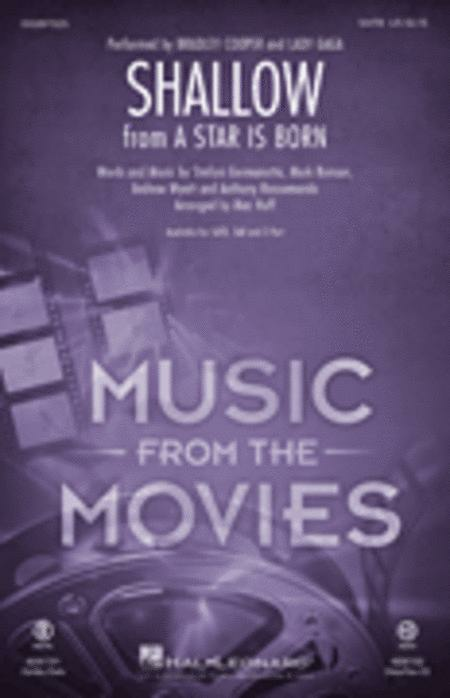 This academy award-winning song from A Star Is Born, “Shallow” marks the moment at which Lady Gaga's Ally is thrust into the spotlight and the title of the film is fulfilled. Marked by a beautiful and conversational opening passage with opportunities for soloists, the back half of the arrangement stays true to the original melody with effective harmonies, country rock phrasing and a musical assuredness that juxtaposes phenomenally with the hardship and all-or-nothing rhetoric that the text presents.